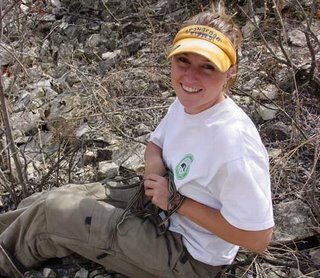 Check out Stone Lab's resident researcher, Kristin Stanford, on the Discovery Channel's popular "Dirty Jobs" program in its season premiere on Tuesday, November 28th (tonight!) at 9:00 p.m. The show will center around Kristin's research on protecting the Lake Erie Water Snake, a group of biters who spray musk and feces at researchers who pick them up. She catches the snakes, weighs them, and induces their vomit so she can check up on their diet (fun, huh?). Kristin hopes the show will spotlight Stone Lab's REU, or Research Experience for Undergraduates, Program. The program at Ohio State allows students from all over the country to work on supervised, independent research projects in a variety of disciplines like herpetology, limnology, and fisheries. Students gain valuable skills in data collection and analysis, scientific reading and writing, as well as practice in oral presentation. This professional-level experience is an excellent preparation for graduate studies or professional life. And make sure you watch the show tonight!